The magic duo of Ford Mustang and Carroll Shelby bring open-air excitement to the road for the 2008 model year as the Ford Shelby GT returns with a new convertible body style and a new standard color combination. Like all Shelby Mustang models, production will be limited to assure exclusivity for collectors. 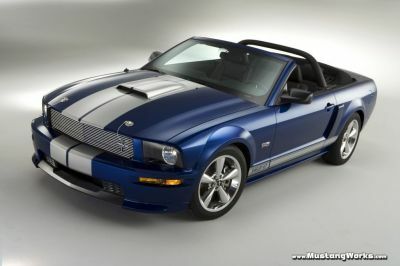 The 2008 Shelby GT will be available in coupe and convertible from select Ford dealers beginning in August 2007. The 2008 Ford Shelby GT convertible will be formally introduced to Shelby and Ford enthusiasts at the Mid-America Ford Performance and Shelby Meet, which opens today in Tulsa, Okla. In 2007, Ford Division, Carroll Shelby and Ford Racing joined forces to create a retail version of The Hertz Corporation Shelby GT-H coupe called the Shelby GT. Fewer than 6,000 total 2007 Shelby GTs were built and were only available in Performance White or Black. For 2008, the highly-coveted Shelby GT is available in a new paint combination of Vista Blue with Silver stripes and the choice of two body styles, coupe or convertible. Shelby GT models begin life as a specially-equipped Mustang GT assembled at the AutoAlliance International assembly plant in Flat Rock, Mich. The cars are then shipped to the Shelby Automobiles facility in Las Vegas for transformation before delivery to Ford dealerships nationwide. Every Shelby GT is built to perform and is the result of extensive development. Aerodynamics were key to sculpting t he powerful, unique front fascia with aggressive lower air dam. The hood scoop comes directly from the famed Shelby Cobra roadster while unique side scoops are positioned just before the rear wheel arches. The rear fascia frames dual exhaust tips and a Shelby badge is on the trunk lid. Under the hood, the engine is upgraded with a Ford Racing Power Upgrade Package to increase output of the 4.6-liter V-8 to 319 horsepower and 330 lb.-ft. of torque. A high-flow exhaust system with X-pipe crossover offers better power delivery and a throaty V-8 exhaust note. Shelby GT comes standard with a five-speed manual transmission featuring a Hurst short-throw shifter for precise shift action. A five-speed automatic transmission is optional. The balanced package includes a Ford Racing Handling Pack with special-tuned dampers, unique sway bars and a 3.55:1 ratio rear axle assembly for improved off-the-line acceleration. The overall ride height was dropped to reduce body roll while a front strut-tower brace adds additional strength to the chassis structure. The 2008 models will sport 18-inch polished wheels with high-performance P235/50ZR18 BF Goodrich gForce tires to maximize the upgrades. Like all Mustang convertibles, each drop top will have supplemental bracing to give the car additional stiffness and the Shelby team will add a stylish light bar. Approximately 2,300 2008 Shelby GT coupes and convertibles will be built, available with manual or automatic transmission. Each car will feature an authentication plate on the center dashboard, as well as a matching tag under the hood for documentation in a forthcoming registry. Shelby Automobiles production is scheduled to begin in August 2007. Ford Motor Company, a global automotive industry leader based in Dearborn, Mich., manufactures or distributes automobiles in 200 markets across six continents. With more than 280,000 employees and more than 100 plants worldwide, the company’s core and affiliated automotive brands include Ford, Jaguar, Land Rover, Lincoln, Mercury, Volvo, and Mazda. The company provides financial services through Ford Motor Credit Company. For more information regarding Ford’s products, please visit www.fordvehicles.com. Founded by legend Carroll Shelby, Shelby Automobiles, Inc., manufactures and markets performance vehicles and related products. The company manufactures authentic continuation Cobras, including the 427 S/C, 289 FIA and 289 street car component vehicles. The company has partnered with Ford Motor Company to produce the Shelby GT, Shelby GTH and GT500KR, which are based on the Mustang. For more information about Shelby Automobiles, visit www.shelbyautos.com.